I recently had a lengthy conversation with my friend, Ken regarding social media. This made me think a bit about my own involvement. Ken is a very casual user of Facebook. My wife, on the other hand, is a very active user of Facebook and Instagram. She has created and administers a Facebook group on blue and white china and is a very active participant in groups related to her passions: roses, gardening etc. She documents her daily activities on her main Facebook page. I’m somewhere in the middle. I’m an instagram user but have never posted anything. Between 2010 and 2015 I was a fairly active Flickr user but haven’t posted anything in years. I occasionally post to Facebook (mostly pictures). 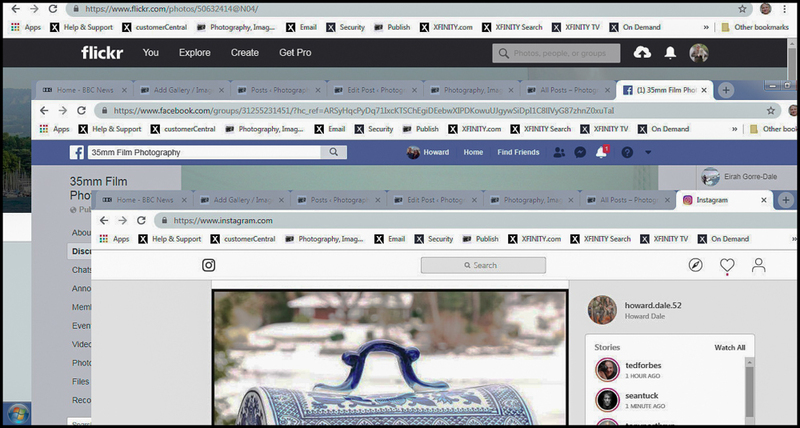 I’m also a member of a number of photography related Facebook groups. I enjoy reading the posts in these groups and very much appreciate the wealth of information and knowledge I’ve gained through them, but I only rarely post to them. My wife seems to spend a lot of time on social media. She reads and comments on posts. She replies to every comment she receives etc. Until recently I couldn’t understand why this required so much of her time. I’ve had cause to change my views, however. It seems to me that the way she does things is the way that social media should operate. If you’re going to be part of a community you need to give as well as take. I’m in the midst of a small experiment. Instead of merely “lurking” I’m trying to contribute more content and I’m trying to reply more to other peoples’ post and to reply to comments I receive. It’s still early days, but one thing I have learned so far is that to do this well requires a significant investment in time. I wonder if I can keep this up.